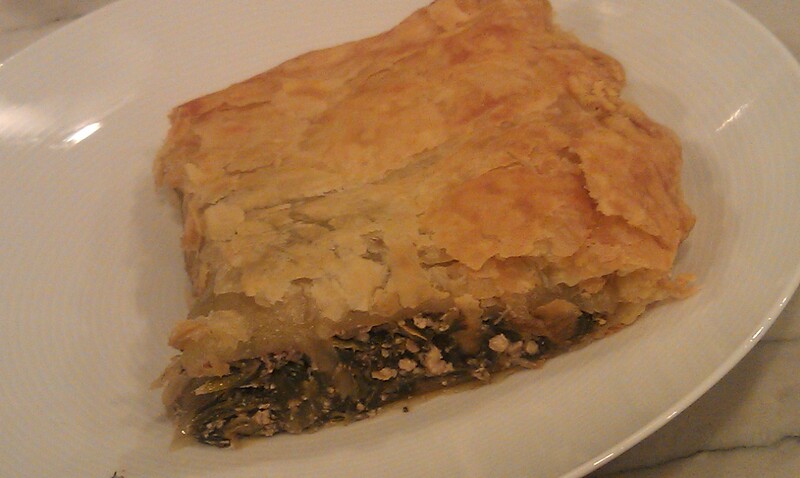 My kids are Obsessed with Spanakopita so naturally I had to make some at home. It was hard to save them some 😉 but we did manage it. I have made this since without the puff pastry because the filling is just so good on its own. 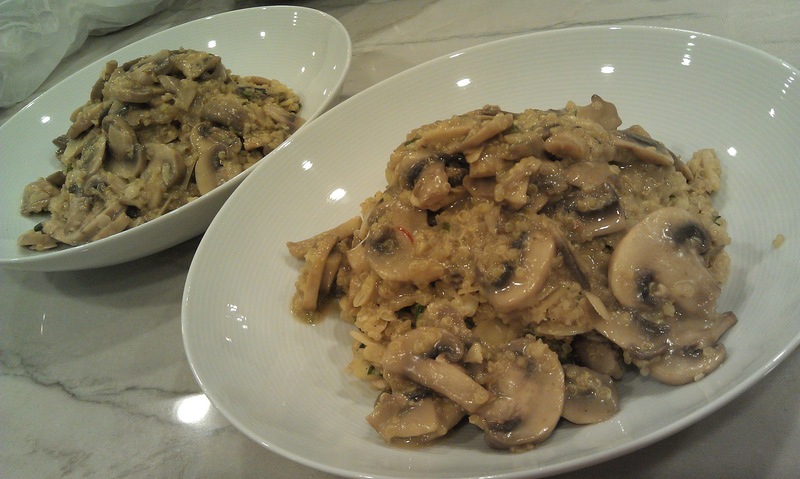 Also love my veganized version with tofu, no one would even notice, it is just so good! Saute the onion with a little salt in olive oil until translucent. Add in the leeks, garlic and scallions, season with salt, and continue to saute until translucent. Combine the spinach, tofu, dill, lemon juice, walnuts, nutritional yeast, salt, pepper, olive oil & spices together and mix well. Combine onion mixture with the spinach/tofu mixture. Line a baking sheet with ether parchment paper or aluminum foil. Unfold puff pastry and place on baking sheet. 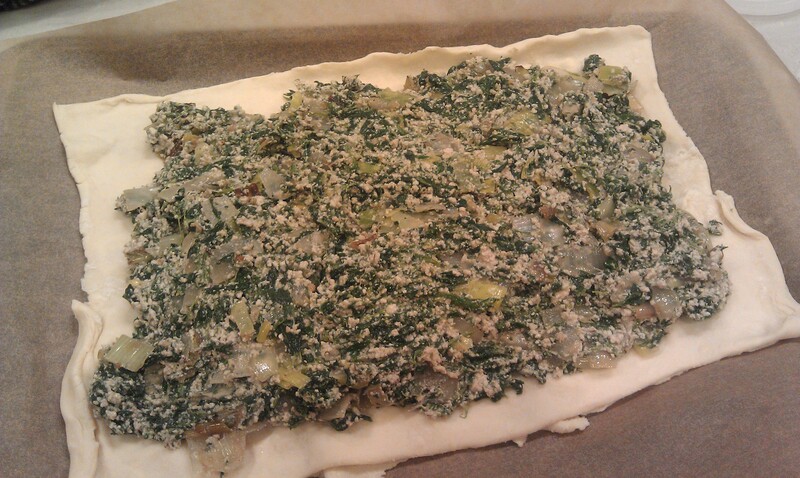 Spread the spinach mixture over the pastry, leaving a border of one inch all around the edges. Keep the spinach flat; do not pile high. Cover with the second sheet of pastry that has been slightly flattened to one inch bigger than the first sheet. (This ensures all the spinach will be covered). Press edges together with fingertips, making sure mixture is sealed well. Brush just the top with non-dairy milk, Cut a few slits in the top with a sharp knife to allow steam to escape. Bake 30-40 minutes, until golden brown. Can be served hot or at room temperature. You have options for the extra filling. 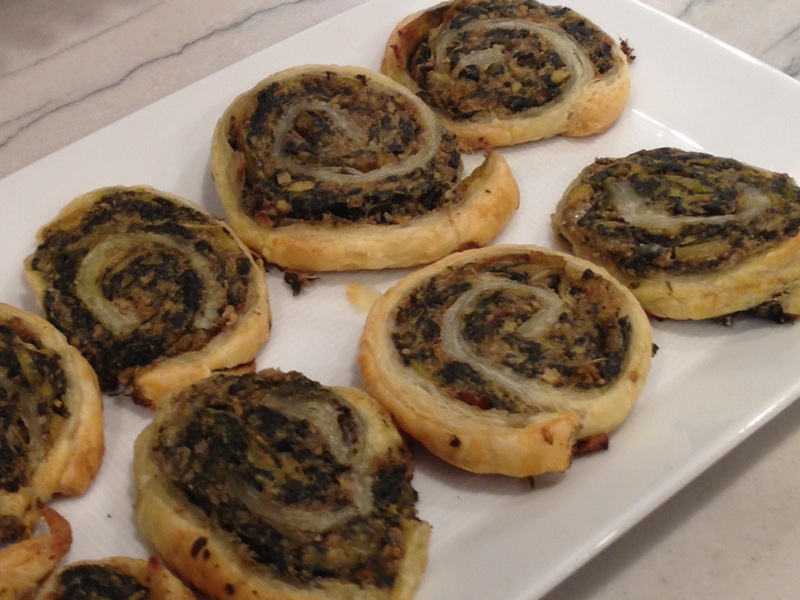 You can use it like a dip, eat it with a spoon or take another sheet of puff pastry and made deelish spinach pinwheels! For the pinwheels: Unfold the pastry sheet on the work surface. Top with the spinach mixture. Starting at a short side, roll up like a jelly roll. Cut into 1/2-inch slices. Place the slices onto 2 baking sheets. Bake for 15 minutes or until the pastries are golden brown. Remove the pastries from the baking sheets and let cool on wire racks for 10 minutes. Just reading the name of this recipe makes my mouth water with how good it was!!!! To me this was perfect date/impress/romantic/thank goodness for leftovers food. 1. Using a large pot – bring your water and a pinch of salt to a strong boil. Add the rinsed quinoa. Cover with a small vent and allow to boil for 10-12 minutes on med-high heat. 2. When the ten minutes is up, remove the lid completely from the large quinoa pot. Not all the liquid will be absorbed. Add in: all your almond, scallions and a splash of coconut milk. Also grind in some fresh pepper. 3. Stir with a wooden spoon and turn the heat down a bit. 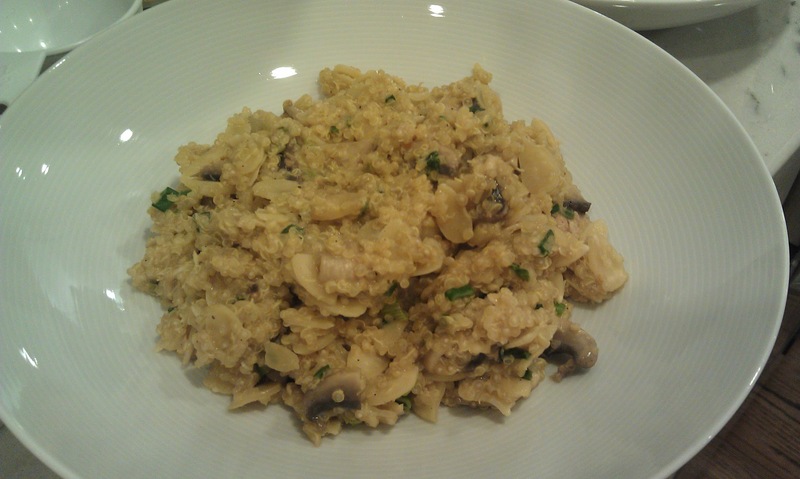 The ingredients will begin to absorb more of the liquid and a thick risotto will begin to form. 4. Next add in the nutritional yeast, maple syrup (just a splash), garlic powder and risotto mushrooms. Continue folding the quinoa until a moist thick consistency forms. Like a very thick oatmeal. Turn heat off and begin spooning the quinoa out of the pot and into a serving/storage bowl. You can also begin plating your quinoa. 5. In the same pot, you will make the gravy. 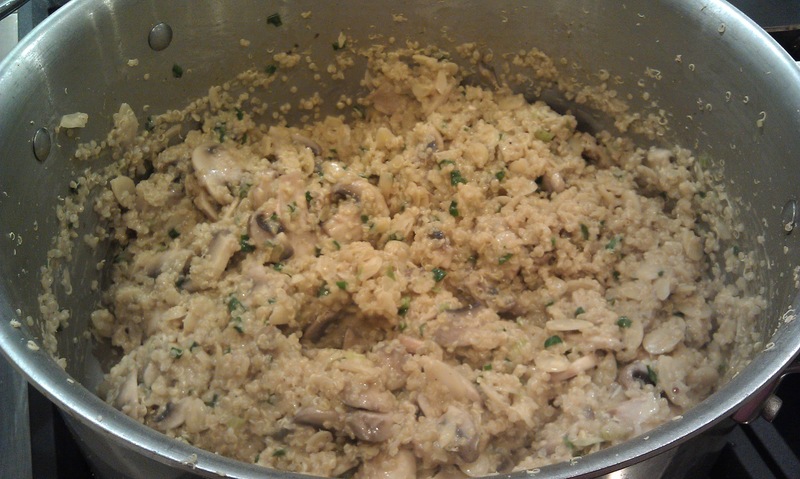 It’s OK if some of the quinoa ( a few spoonfuls) remains in the pot. This will help to thicken your gravy. 6. For gravy: add all the gravy ingredients and stir on medium until sauce thickens. Allow saffron to bloom. 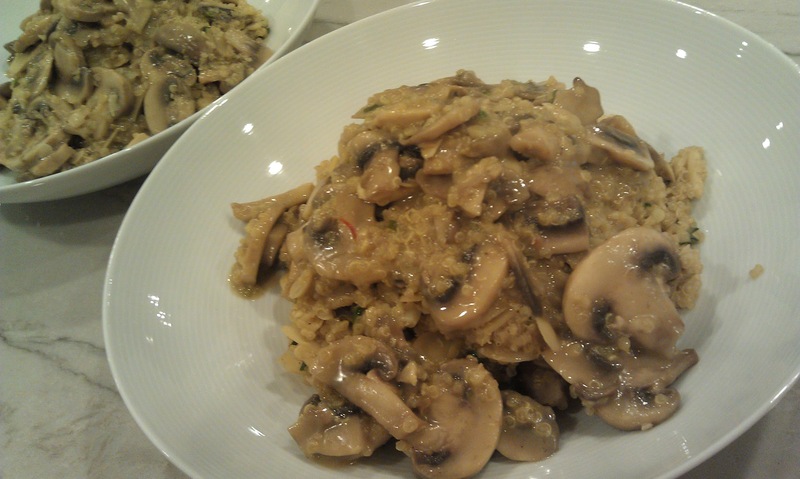 Remove from heat and spoon gravy over top plated quinoa – or transfer to a gravy serving bowl. 7. Plate your risotto and then add the gravy. 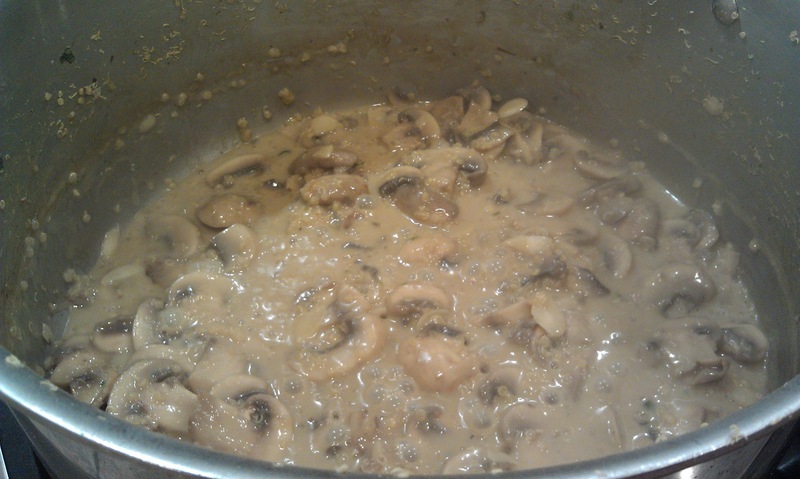 Garnish with fresh pepper and plenty of mushrooms from the gravy. ENJOY! !